I’m at the end of my final field season of Gyrfalcon work for my Masters degree in Raptor Biology. I came here over a year ago, new to the region and unsure of how to accomplish the goals I had planned on paper. Luckily I had the help of a local man with a lot of knowledge, a falconer with a passion for Gyrfalcons, John. From the beginning he has been an integral part of the work here, providing logistical support through the use of ATV’s, trailers, his land, and the list goes on. The man is so generous, and won’t accept payment or help in return. 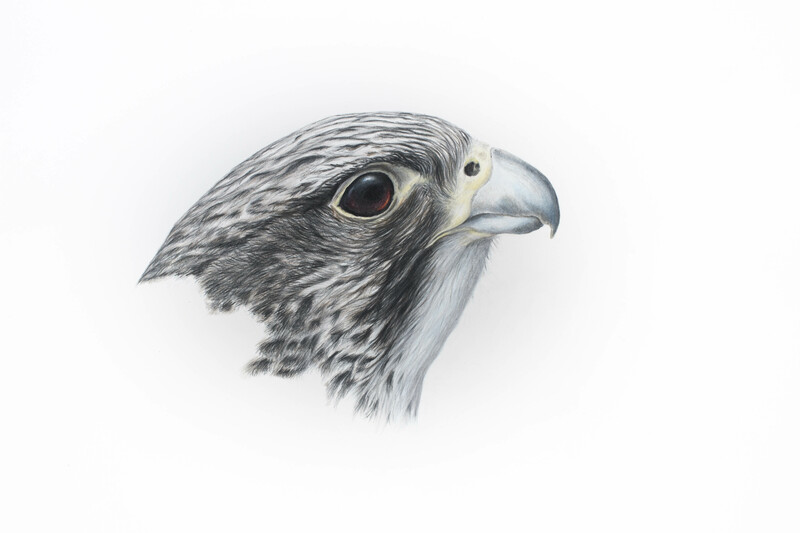 So, to try and pay him back I illustrated this Gyrfalcon. I used his bird, Tinsel, as the model. This illustration is certainly not enough to repay John for everything. I myself, and The Peregrine Fund, will be forever indebted to him for his help. Thanks John.